AC-4 is held on the day of his capture by a member of the recovery team, which could sometimes go months without catching a condor. After capture, AC-4 has his old number removed before going into the captive breeding program at San Diego Zoo from 1985-2014. AC-4 was one of the final 22 California condors in the world captured and taken into the recovery program between 1983 and 1987. California condor #20, transferred to a flight pen at Bitter Creek last September, receives a tracking number and transmitter in preparation for his release. SCE field supervisor Mark Hubbard oversees the installation of the bigger mock power pole in 2014 by a three-man line crew of Daniel Ocegueda, Joel Garibay and Julian Macias. 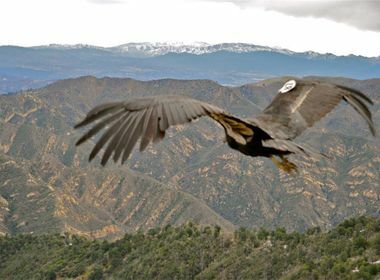 When released after 30 years, California condor #20 first hesitated to leave his flight pen before soaring out of sight over a canyon, ravine and several ridges at Bitter Creek. SCE’s avian protection program has worked closely with the California Condor Recovery Program to help save the species. Do you remember Easter Sunday 1987? California condor aficionados might since that was the day the last of the 22 condors left in the country was captured and introduced into the California Condor Recovery Program in a bid to save the near-extinct breed. But it is another condor captured on Aug. 7, 1985, that took on special meaning recently for the program. After 30 years in captivity, the 35-year-old male named California condor #20 took flight for the first time at Bitter Creek National Wildlife Refuge in Kern County. And this condor has played a significant role in the recovery of North America’s largest flying birds. The condor population has grown to 435 during the recovery program. Of those, 268 live in the wild — 155 in California, 80 in Arizona and Utah, and 33 in Baja California, Mexico, and 167 remain in captivity. Last year, for the first time since the 1980s, condors hatched and fledged in the wild (14) exceeded adult wild condors (12) that died. California condor #20 was released near where he was originally caught and is among 78 flying free in Southern California. He fathered the first chick born into the program in 1988 at the San Diego Zoo, then went on to sire 30 more chicks that have been released into the wild — the third-most productive sire in the program. 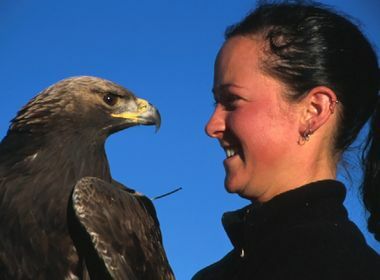 “The bird can now live out the remainder of its life back in the wild, while his legacy and contributions to condor recovery live on in future generations,” said Jesse Grantham, a former condor recovery coordinator, who helped capture the bird in 1985 and returned to witness its release. Today, condors remain most threatened by lead poisoning, microtrash and power lines. 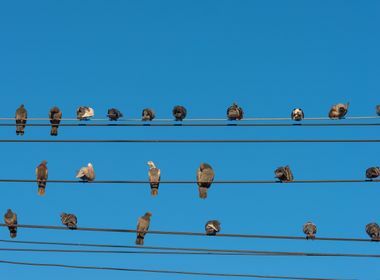 Southern California Edison, through its avian protection program and Transmission & Distribution unit, is a partner in the wildlife service’s successful power pole aversion training. The training uses mock power poles inside and outside flight pens that deliver an uncomfortable but harmless shock to condors landing on them, helping the birds associate them with danger. No captive-bred condor has been electrocuted while perched on a power pole since the training began in 1994, said Ashley Spratt, the wildlife service’s public affairs officer, noting that the birds are tracked by transmitters and ID numbers attached to their wings. California condor #20 received the aversion training, which is a key component of the wildlife service’s ultimate goal of establishing two geographically distinct, self-sustaining populations, each with 150 birds in the wild and at least 15 breeding pairs, with a third population of condors retained in captivity. A goal that Mark Hubbard, an SCE field supervisor who saw no condors land on the poles while helping install them, is rooting for. “I think it’s great that SCE provided the materials and manpower to install these poles to help continued efforts to bring the condor population back to a safe level,” he said.